Managing director Ken Rattenbury said customers were “ultra-concerned” about food being held up at ports. The UK government insisted the country’s high level of food security would continue “whether we leave the EU with or without a deal”. 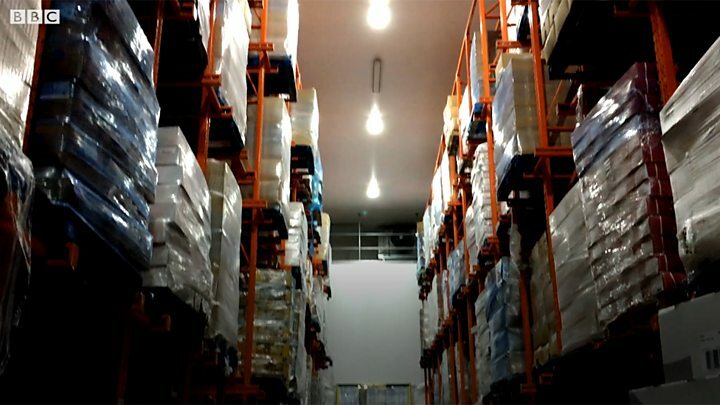 Wild Water’s Cardiff warehouse has capacity for 17,000 pallets. Across all its storage sites it is storing 40,000 pallets. “This is people just holding stock because they’re concerned about next year, when we get to March, if there’s no deal, they will not be able to get their products here,” Ken Rattenbury said. “It’s completely out of sync to how we normally are… We’re turning businesses away every day, every single day,” Mr Rattenbury said. Mr Rattenbury said: “I’m 100% confident [this is because of Brexit]… I had meetings this week and people are telling me they’re ultra concerned about the borders etc. “Their stock [can’t be] held up at the ports because a lot of it is fresh and so they’re looking to freeze it down. “This may include storing increased volumes of ingredients, and chilled and frozen foods,” she added. A UK government spokesperson said: “The UK has a strong level of food security built upon a diverse range of sources including strong domestic production and imports from third countries.